Chromogranins are members of a family of soluble glycoproteins sharing common structural features and properties, known to be inducers of prohormone aggregation and sorting into secretory granules. 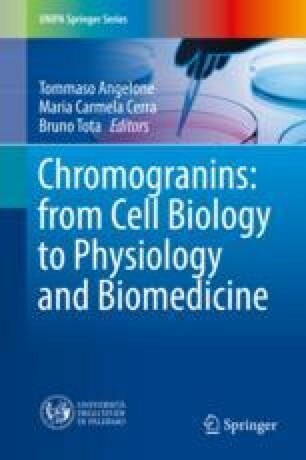 There is now increasing evidence for a key role of chromogranins in hormone sorting to the regulated secretory pathway, resulting from the interaction of chromogranin-induced aggregates with the TGN membrane through either sorting receptors such as carboxypeptidase E, or lipids such as cholesterol. These molecular interactions would contribute to the TGN membrane remodeling, a prerequisite to the recruitment of cytosolic proteins inducing membrane curvature and consecutive secretory granule budding. The identification of the molecular cues involved in the biogenesis of secretory granules is currently under intense investigation. The diversity of chromogranins sharing common structural features but with possible non-redundant functions implies a variety of secretory granule populations whose existence and function remain to be established in a given neuroendocrine cell type. The present chapter deals with the role of the different members of the chromogranin family in the processes of hormone aggregation, secretory granule biogenesis, and hormone sorting through their interaction with the TGN membrane. Finally, the alteration of chromogranin secretion is described in pathophysiological conditions linked to dysregulated hormone secretion.